› Author AffiliationsThis work was partially supported by NRF-2017R1D1A1B03031393. The authors declare no competing financial interest. 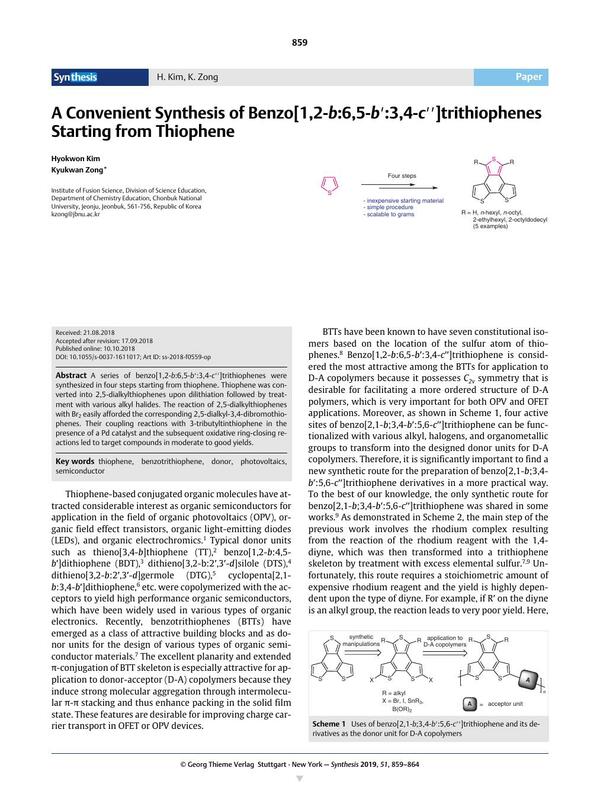 A series of benzo[1,2-b:6,5-b′:3,4-c′′]trithiophenes were synthesized in four steps starting from thiophene. Thiophene was converted into 2,5-dialkylthiophenes upon dilithiation followed by treatment with various alkyl halides. The reaction of 2,5-dialkylthiophenes with Br2 easily afforded the corresponding 2,5-dialkyl-3,4-dibromothiophenes. Their coupling reactions with 3-tributyltinthiophene in the presence of a Pd catalyst and the subsequent oxidative ring-closing reactions led to target compounds in moderate to good yields.